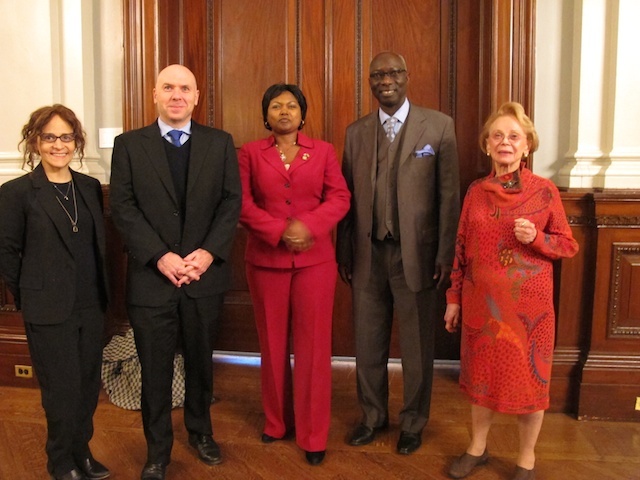 NEW YORK, NEW YORK – On January 13, 2015, AIPR and the New York City Bar Association co-organized a panel discussion to address challenges within the existing international legal framework for the prevention of genocide and other mass atrocities. The event, “Preventing Genocide and Mass Atrocities: International Law and the Responsibility to Protect (R2P),” challenged panelists to consider why, nearly a decade after heads of state and government agreed to the principles of R2P, mass atrocities continue across the globe in Libya, Syria, the Central African Republic, and beyond. Four panelists outlined their views regarding this critical question, and other related topics. They included Dr. Simon Adams, Executive Director of the Global Centre for the Responsibility to Protect; Adama Dieng, Special Adviser to the UN Secretary-General for the Prevention of Genocide; H.E. Ambassador Mathilde Mukantabana, Ambassador Extraordinary and Plenipotentiary of the Republic of Rwanda to the United States; and Sheri Rosenberg, AIPR Board of Director member and Professor of Law and Director of Human Rights and Genocide Clinic at the Cardozo School of Law. More than 75 people attended the two-hour discussion at the New York City Bar Association’s NYC headquarters. A member of the audience posed a question about the importance of addressing endemic corruption—a problem brought into sharp focus in the recent OECD report on foreign bribery that found most international bribes are paid by large corporations, usually with the knowledge of senior-level executives. “The promotion of good governance will help with prevention,” said Ambassador Mukantabana. 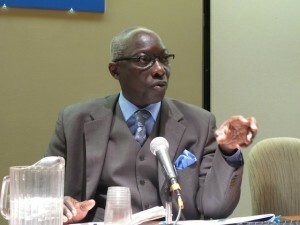 Added Mr. Dieng: “With corruption there are two parties: the corrupted and one who is receiving. The amount of billions stolen from Africa could have solved most of the problems in Africa.” Unfortunately, he added, “political will is missing” to decisively end corruption. For an audio recording of this event, please click here.